Hope you are all enjoying this holiday season with all things fried and delicious. 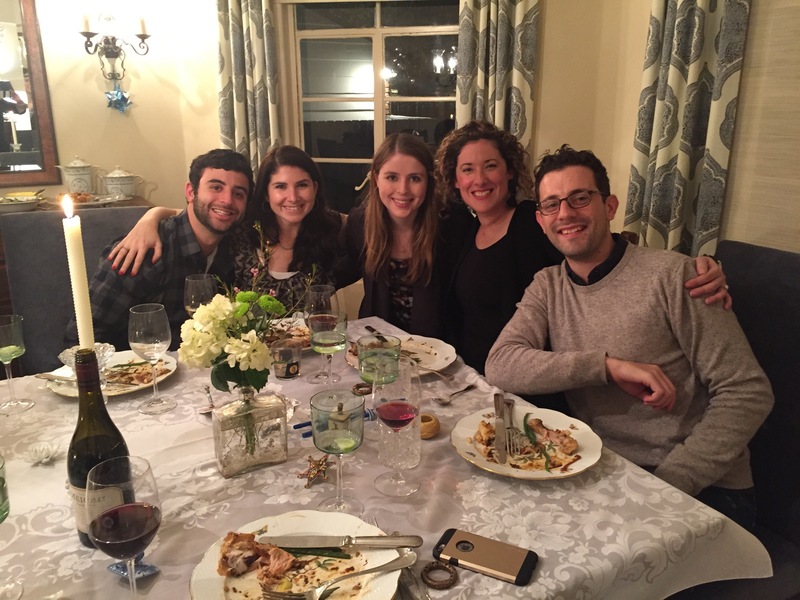 I was so glad to be able to spend a few days with my family in LA this year for Hanukkah. To celebrate, we made ALL the latkes. 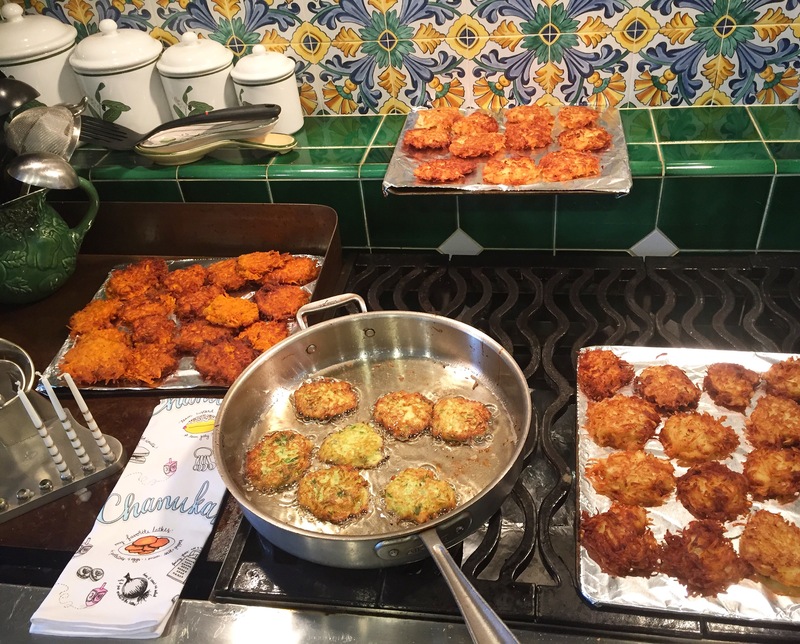 It’s so worth it to make latkes from scratch and we had fun experimenting with some new recipes this year. My dad and I started our latke conquest with traditional potato latkes from Judy Zeidler whose the original queen of Jewish cookbooks. To speed things along we used a food processor instead of a hand grater. 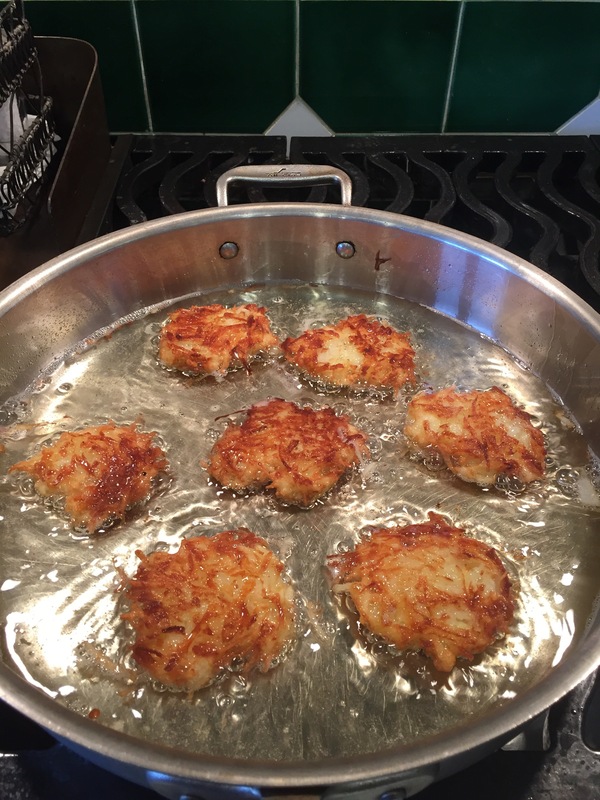 A tip to get the latkes extra crispy is to squeeze out any water once you grate the potatoes. You’ll be surprised how much water there is so squeeze out as much as you can in a dish towel over a sink. Also you should only flip the latkes once per side and you will need lots of oil and lots of patience! 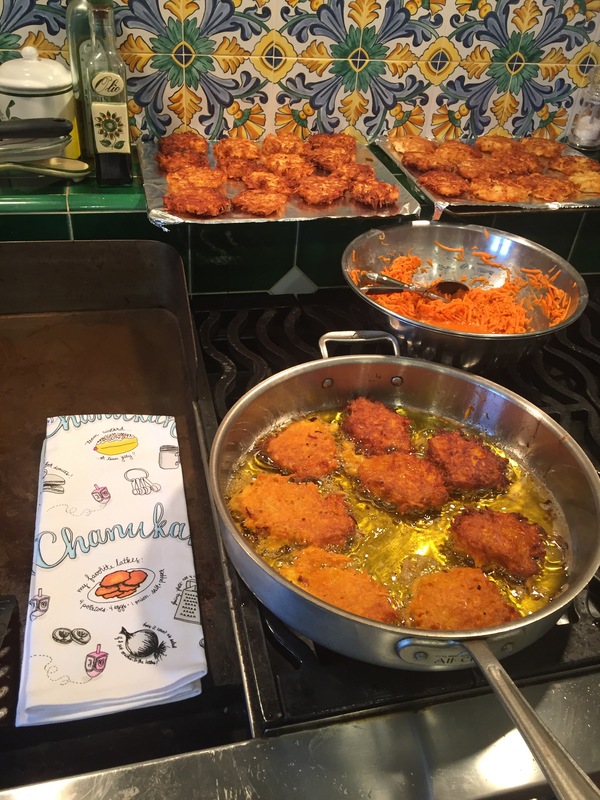 Next up were Sweet Potato Curry Latkes from the memoir/cookbook Stir from Jessica Fechtor. You can find the recipe here. These had a very subtle kick to them because of the curry yet there wasn’t much heat just flavor. They were definitely the crowd favorite. Be sure to change out the oil between different batches to not mess with the flavor. We were intrigued with a zucchini pancake recipe in the LA Times and had to add them to the tasting. 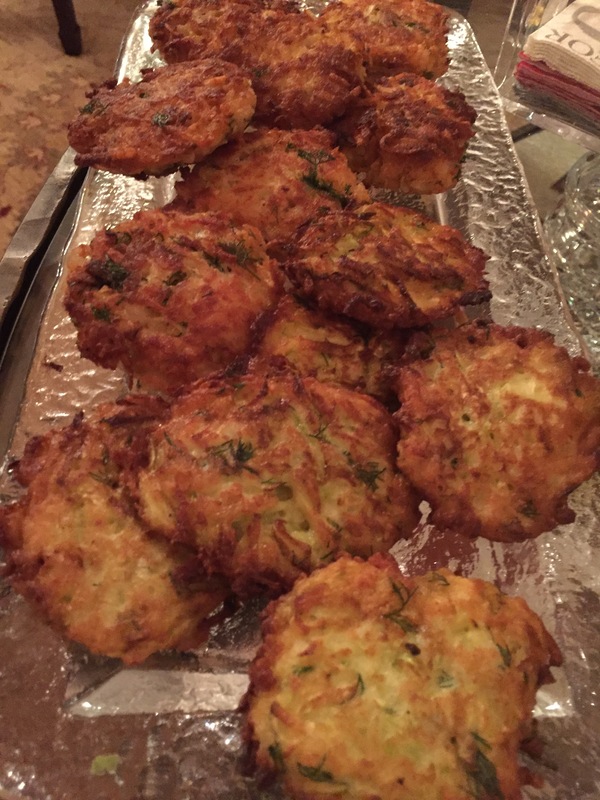 These were a fun twist to the typical latkes and much more delicate because no potatoes were used. We swapped out dill for mint which was a great combo with the zucchini. Traditional and sweet potato latkes are great served with a bit of applesauce , for the zucchini ones you could try sour cream. And of course no Hanukkah is complete without a brisket. 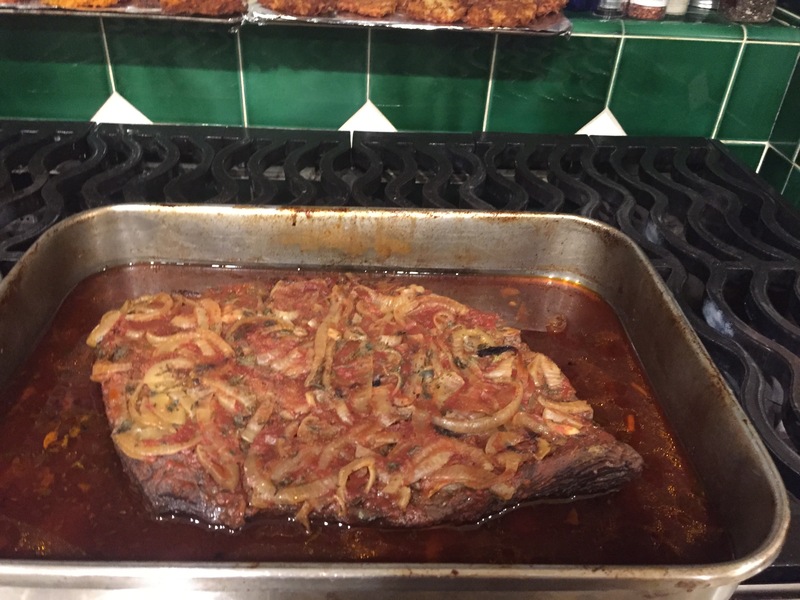 The Smitten Kitchen tangy spiced brisket I made over Passover is still my favorite brisket recipe and my family loved trying it finally too. The caramelized onions on top and sweet/sour type sauce make it especially tasty. Brisket never photographs well but this one is seriously delish. We rounded out the meal with an arugula and pomegranate salad, steamed green beans, noodle kuggle, and our family’s favorite cranberry apple cobbler for dessert. My dad and I always have a blast together in the kitchen. 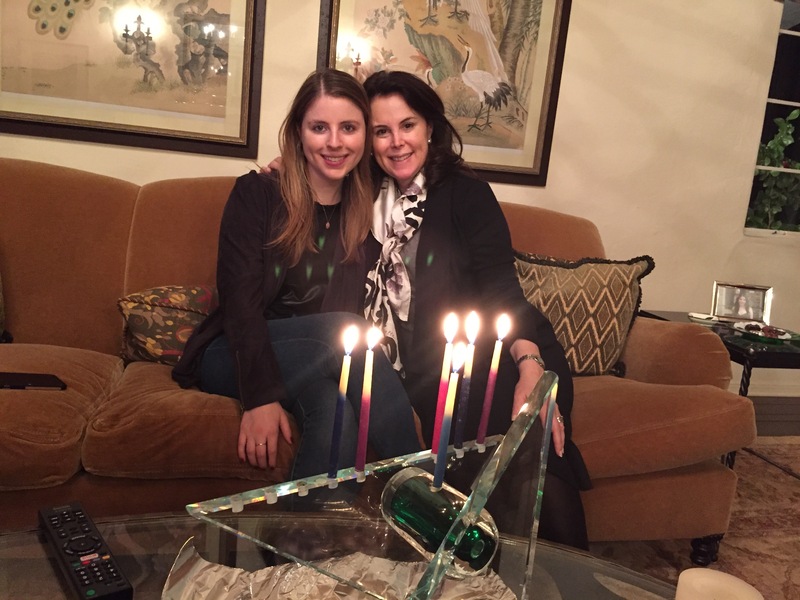 Loved having Lisa and Lucas in town from Houston to celebrate their first Hanukkah! Previous Previous post: Last minute gift ideas!